Instead of relative paths, WordPress stores full URLs in the database, in many different columns and tables. These URLs, along with other data, can be stored as PHP-serialized blobs. Because PHP serialization includes the string length in the blob, replacing one value with another value of a different length also needs to update the encoding as well. WP-CLI’s search-replace command addresses both of these problems for you, with its awareness of WordPress’ tables, and intuitive handling of serialized data. Last month, Pantheon generously sponsored 15 hours of my time to address some of the long-standing bugs in the backlog, and make a few substantial enhancements too. On Pantheon, wp search-replace is an integral part of the Pantheon Workflow. Let’s take a look at how search-replace works, and then we’ll review the new features coming in WP-CLI v0.22.0. By default, WP-CLI searches through all tables registered to the $wpdb object. In each column of each table, it first inspects the column’s rows to see if serialized data is present. If it discovers serialized data, then it iterates through all of the rows, de-serializes data as relevant, recursively performs a search and replace procedure, and updates the row in the database. When no serialized data is present in any of the rows, the replacement procedure is a much simpler MySQL UPDATE statement. On multisite, WP-CLI defaults to performing search-replace on a single site. You can search-replace across all sites in the network with the --network flag. Want to inspect the results of your search-replace command without making changes to the database? Use the --dry-run flag to mock the entire operation, and see a summary of how your database would’ve been modified. A huge performance boost! Instead of running a MYSQL LIKE statement every 1000 rows, WP-CLI now just runs it once. On a post meta table of ~3.5 million rows where 75,610 rows were affected, this change improved execution time from 734.926s to 225.509s (3.3x faster). Use the --export=<filename> argument to create a SQL file of your transformed data, instead of making updates to the database. This is a helpful feature when you want to prepare a database for a new environment without having to import and then run search-replace. Wildcards can be used in table names. search-replace against meta tables with wp search-replace <old-string> <new-string> '*meta*'. Note: the table pattern needs to be quoted, as * is a special character in Bash. Execution time is indicated when running search-replace with the --verbose flag, in case you’re curious to see how long each replacement operation is taking. Posted byDaniel Bachhuber January 6, 2016 Posted inCategorizedTags: open source, Pantheon, WordPress, WP-CLILeave a comment on Love and profit for wp search-replace — thanks Pantheon! If you’re seeing this, then my blog is back to being hosted on WordPress.com. The primary reason for this? I want to blog more often. The writing interface in WordPress.com is now much, much better than what you get in a standard WordPress install. Plus, there’s also something to be said about not having the mental overhead of site management every time you go to write a blog post. This domain’s history: switched from 1&1 to WebFaction in June 2009, to Slicehost in May 2010, back to WebFaction in September 2010, to WordPress.com in November 2011, to Digital Ocean in March 2014, and back to Webfaction in January 2015. Earlier this month, I helped relaunch Pottery Barn’s blog. The homepage and each brand page (PBteen example) are moderately configurable through the WordPress Customizer. Building this functionality was an opportunity to make user-friendly decisions about the management experience. 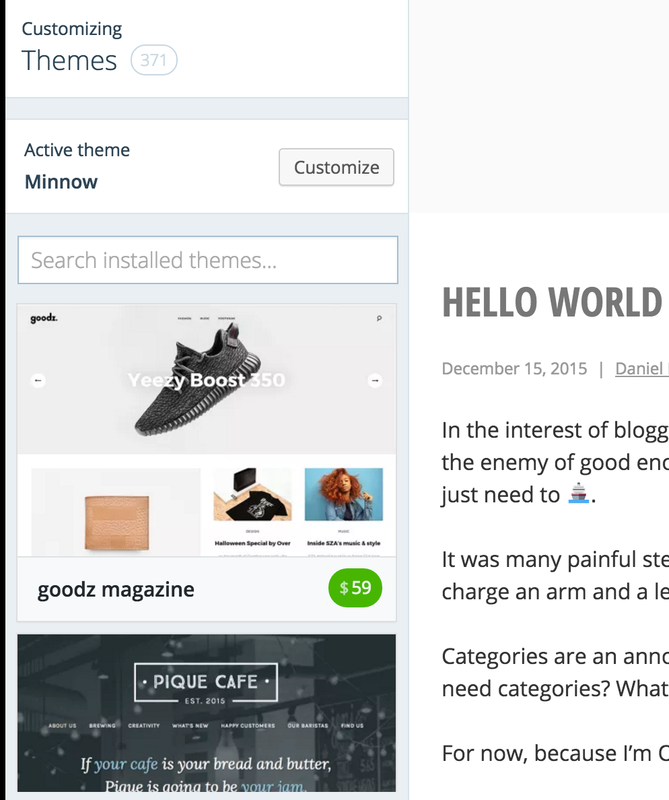 By default, the topmost UI element on each homepage will display the most recent published post. In the Customizer, the Pottery Barn team can choose one or more posts for promotion with an AJAX post selection tool (plugin in-progress). 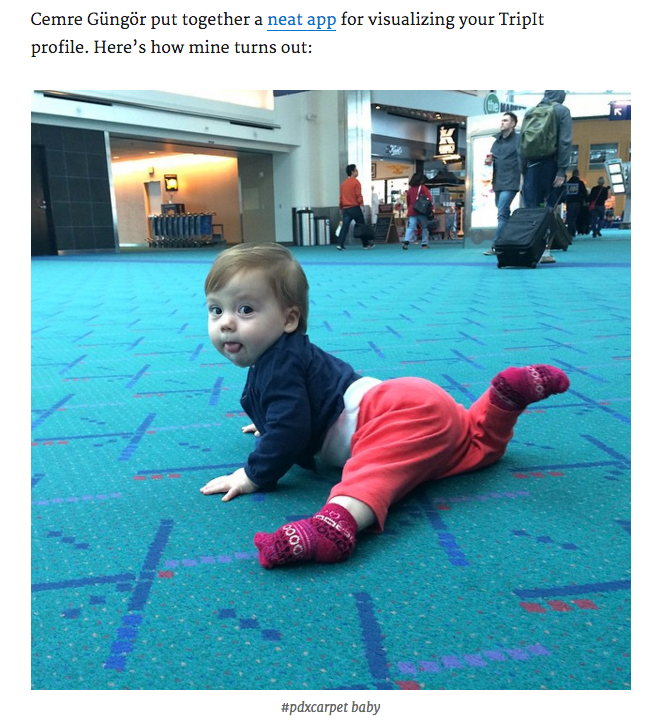 If multiple posts are selected, then the UI element turns into a carousel (powered by Slick). 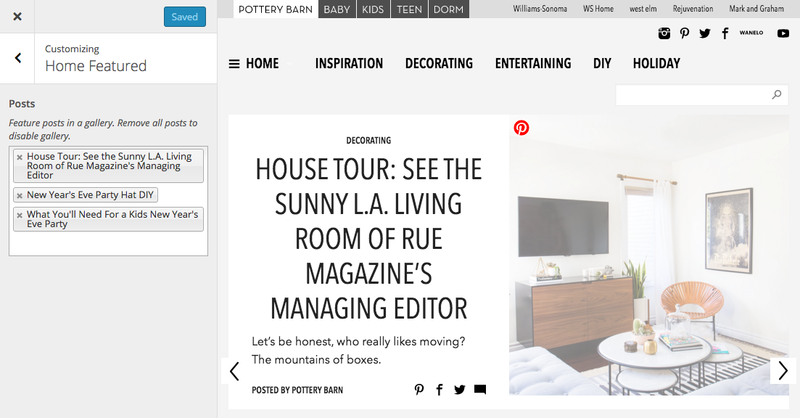 Further down the homepage, the Pottery Barn team wanted to promote their top Pins from Pinterest. Rather than create a more complicated workflow of uploading images and completing multiple fields per Pin, I decided to magically pull in Pin metadata from their Open Graph / Twitter Card tags. Drop a link in — voila! Rather than make a number of on-going frontend HTTP requests, I decided to fetch the metadata when the links are saved, and store it in options. Pinterest will block your IP address if it thinks you’re a bot. If your code mysteriously stops working, you might want to check the response. Pinterest’s Twitter Card image source is better to work with than Facebook Open Graph because Pinterest forcefully crops the Open Graph image to a Facebook-friendly proportion. The Twitter Card image source appears to be the original proportion.